This fourth edition German dicitonary has been extensively revised and updated to cover all the vocabulary of current issues (alcopop, netiquette, windfall tax, Elchtest, Reformstau), and all changes from the recent German spelling reform have been incorporated into the text. 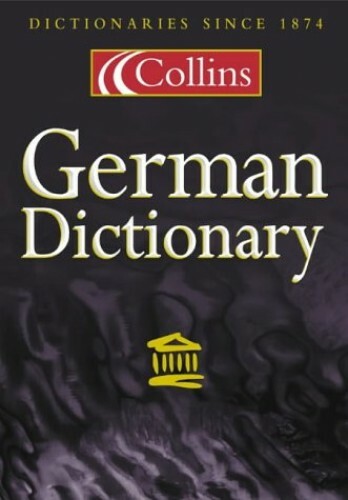 Covering all the vocabulary of current issues, with evidence drawn from Collins' unique multi-million word databanks of contemporary German and English, the fourth edition also incorporates all of the changes from the recent German spelling reforms for up-to-the-minute accuracy. Collins are delighted to announce the publication of the fourth edition of Collins German Dictionary. The dictionary has been extensively revised and updated to cover all the vocabulary of current issues (alcopop, netiquette, windfall tax, Elchtest, Reformstau), and all changes from the recent German spelling reform have been incorporated into the text. Thousands of new phrases and indicators have been added from evidence and examples drawn from Collins' unique multi-million word databases of contemporary English and German, ensuring the user has the most complete and accurate picture of real language available today. New to this edition are special entries on German life and culture which provide the user with detailed information about Germany and the German-speaking world -- politics, education, festivals and traditions -- where a simple translation is not enough. Further new features are improved user-friendliness in style and layout, information on hyphenation and more help on pronunciation, with phonetics now included for German as well as English headwords. All the proven features are retained -- complete reliability and the most up-to-date coverage -- reaffirming this as the German/English dictionary for the new millennium.